Betty Ketsie's red coat is different from the blue work suits worn by the other workers at the factory. "The colour of my coat," says Ketsie with a shy smile, "shows that I am the supervisor. I am also one of the longest serving workers here." But Ketsie's smile quickly disappears when she starts talking about how she nearly lost her job in 2001 when the factory was not making enough profit. would have seen about 20 of the 100 workers losing their jobs. Many of them were women who were single parents. For Ketsie, a 40-year old single mother, this would have meant losing the R250 she earned per month. She wouldn't be able to support her three children or paytheir transport to school. Thanks to the National Productivity Institute (NPI), Dimpho Fresh Foods improved their performance and the jobs were saved. Ketsie's salary was increased to R706 a month. to be more productive and competitive. This is done through a number of programmes that are supported by government departments and organisations working with government. 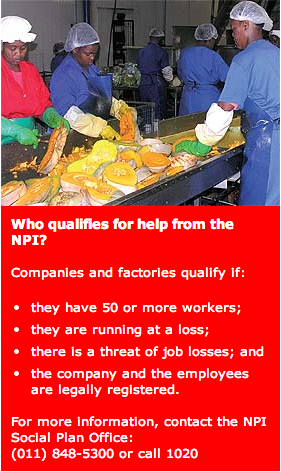 One of the National Productivity Institute's programmes is the Social Plan funded by the Department of Labour. Its main aim is to help companies that are in trouble and to prevent job losses. Dimpho Fresh Foods was one of the companies that benefited from the Social Plan. The company buys vegetables from farmers and prepares them to be used by the mines in their kitchens. In 2004, some business partners bought Anglo Farms and re-named it Dimpho Fresh Foods. But the company was in trouble and the production was poor says Dimpho's managing director, Bruce Morley. Many things, including management, the relationship with farmers and the general operations caused this. In June 2006, when they were already planning to cut down the number of workers, they heard about the National Productivity Institute through a radio advertisement. "The National Productivity Institute appointed a consultant to find out what our problems were," said Morley. "After he spent a month with us, he had enough information to tell us how we could improve our business." "Today we are back on our feet. Production has improved, we are making a profit and we have increased our worker's salaries. 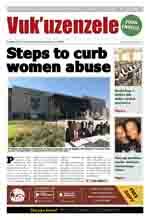 We now make about R1,4 million a month and are ready to employ more people." By March 2006, the National Productivity Institute helped a total of 122 companies and saved thousands of jobs. The National Productivity Institute sometimes goes to companies to offer their help, but usually the companies come to them with their problems. When companies come to them, they send their consultants to check the financial statements and other important documents. They also have meetings with both the employers and the workers. "After helping a company, we make sure they don't get into trouble again by visiting them regularly and giving them advice," said Mario Govinder of the NPI. Companies have to pay 35 per cent of the total cost of the NPI's service. Make a decision every day to be more positive and to do the best you can in everything you do. Plan your day. Make a list of goals for every day and tick them off as you complete them. After planning, prepare for everything. Make sure you have all the right tools to complete your goals. But remember productivity is about doing more with less, so use only what you really need. If you have set a goal, stick to it even if you are faced with problems. You will have a great feeling of success when you finally reach your goal. Check your productivity. Ask yourself every few hours: "Is this the best use of my time today?" Be creative. Think of better ways to do things. You don't always have to work harder, sometimes just more intelligently. Take responsibility for everything you do. Try to do everything 100 per cent right the first time. Set an example to your fellow workers. Don't waste resources, including time. Remember you are paid to use your time productively. See yourself as an important part of making our country more productive. No matter who you are or what you do, you play an important role in making the country more successful. By each of us being more productive and finding better ways of doing things, we are contributing to the economy and helping to improve the lives of all South Africans.